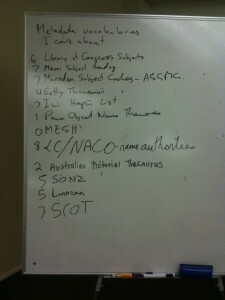 The following was cross posted on the Open Knowledge Foundation blog on 12/20/2011. I recently traveled to Wellington, New Zealand to take part in the National Digital Forum of New Zealand (#ndf2011), which was held at the national museum of New Zealand, Te Papa. Following the conference, the amazing team at Digital NZ hosted and organized a Linked Open Data in Libraries, Archives & Museums unconference (#lodlam). The two events were well attended by Kiwis as well as a large number of international attendees from Australia, and a few from as far as the US, UK and Germany. When it comes to innovative digital initiatives in cultural heritage, the rest of the world has been looking to New Zealand and Australia for some time. Federated metadata exchanges and search has been happening across institutions in projects like Digital NZ and Trove. I was able to learn more about the Digital NZ APIs as well as those from Museum Victoria, Powerhouse Museum, and State Records New South Wales. In fact, the remarkable proliferation of APIs in Australasia has allowed us to consider the possibilities of Linked Open Data to harvest and build upon data held in databases in multiple institutions. Given the extent to which tools for opening access to data have been developed here, I was surprised by the level of frustration that exists around copyright issues. There’s a clear sense that government is moving too slowly in making materials available to the public with open licensing. We talked a lot about the idea of separately licensing metadata and assets (i.e. information about a photo vs the digital copy of the photo), as has been happening across Europe and increasingly the United States. There are strong advocates within the GLAM sector (galleries, libraries, archives & museums) here, and demonstrating use cases utilizing openly licensed metadata will go far in helping to move those conversations forward with policy makers. To that end, a session was convened to explore the possibilities of an international LODLAM project focused on World War I, the centennial commemoration of which is fast approaching. The Civil War Data 150 project we’ve been slowly moving forward in the US may provide a rough framework to build from. At least a half dozen or more libraries, archives and museums have expressed interest in participating in a WWI project already. First steps may be identifying openly licensed datasets to be contributed, key vocabularies and ontologies to apply, and ideas for visualizations that would leverage the use of Linked Open Data. For anything to happen here, someone will need to take the lead in organizing (not me, we’re still trying to build some tools around the Civil War Data 150 concept!). Good notes were posted on the LODLAM blog about the conversation and how to convene future conversations. Anyone who gets involved with this, please spread the word and keep the LODLAM community apprised of your progress and ways to contribute. We also had a workshop on using Google Refine by Carlos Arroyo from the Powerhouse Museum, with props to the FreeYourMetadata crew. 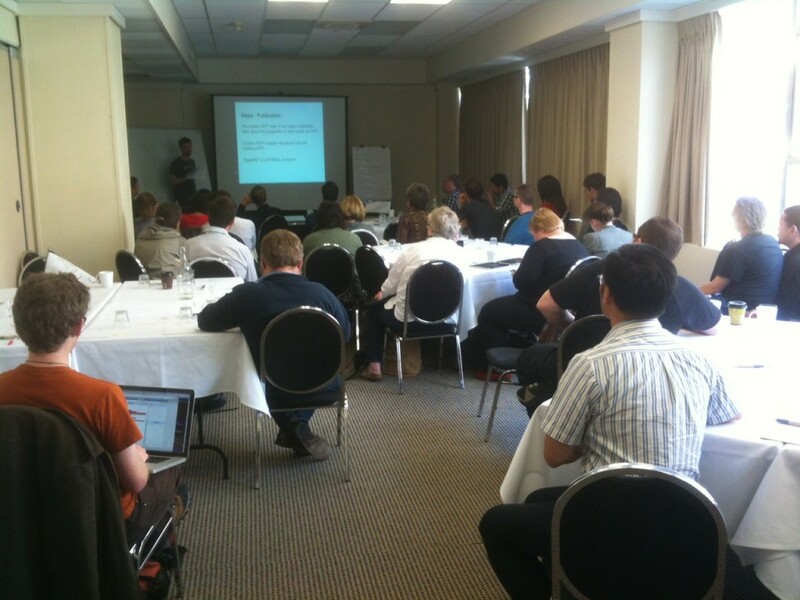 Some lively sessions dug into just what and how Linked Data is and some of the pitfalls and potentials. Another session explored the importance and potential of local vocabularies, and how they can contribute to Linked Data implementations. One great example was the vocabulariessurrounding Maori artifacts (Taonga) at Te Papa, and how publishing those datasets can aid other museums around the world to better describe and provide digital access to Maori collections. As I’ve attended various LODLAM meetups since June, I’ve noticed clear momentum from one to another as these conversations progress rapidly, with those further along helping those of us just learning. 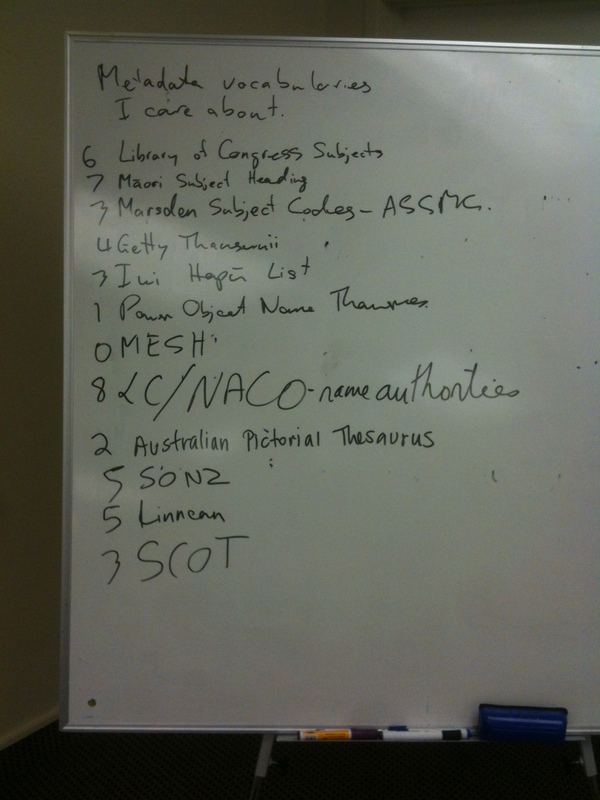 After LODLAM-DC I realized the importance of including library, archive, and museum vendors in all of these gatherings. At LODLAM-NZ I could see the potential of bringing together developers in the GLAM sector and those utilizing Linked Data in commercial settings. In places like San Francisco, where commercial interests are already leading the charge on Linked Data (which is not a bad thing) and there’s an active Semantic Web developer community, the GLAM sector may be playing catchup. But the sheer number of datasets potentially available as open data coming from the GLAM sector, together with the expertise of managing massive amounts of structured data, creates a space ripe for collaboration and experimentation, and these lines will continue to blur.